The Orange County Farm Bureau’s Annual Dinner, held recently at the Central Florida Fairgrounds, saluted the region’s agricultural community and the invaluable contributions of local farmers and ranchers. The keynote speaker at the event, Mayor Teresa Jacobs, spoke about the need for better access to fresh fruit and vegetables among the poor and boosting community health through local “farm to table” initiatives. “As the Sunshine State’s largest general agricultural organization, the Orange County Farm Bureau is doing a terrific job in upholding Florida’s reputation as a national leader in the agriculture and farming sector,” Mayor Jacobs said. Many community leaders and elected officials were in attendance, including U.S. Congressman Daniel Webster, Orange County Commissioner District 1 Scott Boyd, Property Appraiser Rick Singh and Orange County Schools Superintendent Barbara Jenkins. The Orange County Farm Bureau is part of Florida’s largest general agricultural organization, the Florida Farm Bureau Federation (FFBF), which promotes and protects the agricultural interests of farmers and ranchers engaged in production agriculture. This year, the FFBF celebrates 72 years of service in agriculture with about 147,000 members in 60 counties in the Sunshine State. That legacy continues through Orange County Public Schools’ active and thriving Young Farmer and Rancher Program. Students who are part of the Future Farmers of America (FFA) organizations from Apopka Middle School, Wolf Lake Middle School and Piedmont Lakes Middle School – all located in Apopka – and Corner Lake Middle School on Chuluota Road in East Orange County, interacted with longtime agricultural leaders and elected officials at the dinner. “I especially enjoyed spending some time with students from our Young Farmer and Rancher Program, because they are so passionate about our community and maintaining Florida’s abundant supply of agricultural resources,” Mayor Jacobs said. 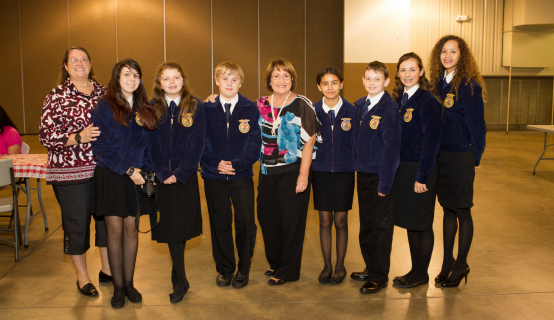 Melissa Hamilton, FFA adviser at Piedmont Lakes Middle School, said her students appreciated meeting with Mayor Jacobs and were inspired by the legacies of local agricultural leaders. A collection of photos from the Orange County Farm Bureau’s Annual Dinner are available on Flickr for use by the media.